Fore wing base of Albardia furcata. From Comstock (fig. 205) . 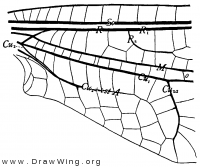 Wings of Ogcogaster tessellata. From Comstock (fig. 204) . Wings of owlfly Neuroptynx appendiculatus. From Comstock (fig. 143) . Wings of owlfly Ululodes hyalina. From Comstock (fig. 142) .